And sure enough after a pitch or two Berra squared into one, a towering fly down the right field line. We had awesome line of flight. The crowd roared and rose to its feet. It landed upper deck foul by the slimmest of margins. Huge groan in the Bronx. I was in Cooperstown once, the Friday of Induction Weekend in 2006. I went not because it was Induction Weekend (I may not have known) but because my Dodger-obsessed friend from LA was in town and she had never been either. We made a day trip out of it, which, Cooperstown isn’t really a day trip from Philadelphia, but I was taking Adderall at the time, so it was a quicker drive than it probably should have been. 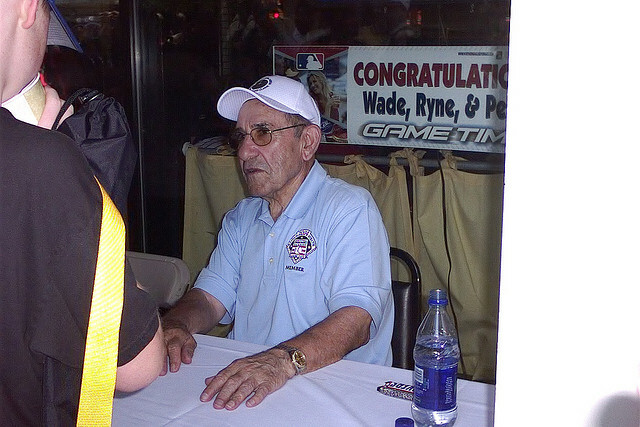 Anyway, we saw Yogi Berra sitting and signing autographs at a small foldout stand in front of a store on Main Street (which is actually called Main Street, because it’s America). Embarrassing fact #1: I thought it was Phil Rizzuto at first. I only figured out it was Yogi Berra (only after walking away, I think–we didn’t get any autographs because everything started at $20 or so, which was more than the museum, if I remember correctly) because I realized Phil Rizzuto was dead. Embarrassing fact #2: Phil Rizzuto wasn’t dead (in summer of 2006– he died the following year). But I’m pretty sure it was Yogi Berra. We did? I don’t remember. This entry was posted on September 27, 2015 at 2:23 pm and is filed under non-de Jesus related. You can follow any responses to this entry through the RSS 2.0 feed. You can leave a response, or trackback from your own site.